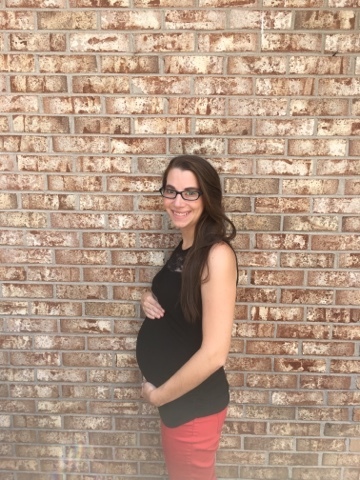 I found red maternity pants! For this Palmetto girl, That is an exciting day! Sleep: Neither good nor bad. It just is. Ha! Best moment this week: My sweet husband and family spent the week in the Dominican with our church's mission team. The best moment may have been hearing about their trip and having them back! Milestones: Eva Kate's eyes are beginning to open and she's growing eyelashes! Also, she is getting her immune system in order and soaking up my antibioties...which is quite literally hilarious to me as my immune system has never been one to be envious of. Major Happenings: Moose enjoyed the Dominican Republic and being able to love on some sweet children and friends there this week. My heart is full from the love he received there...and me as well. 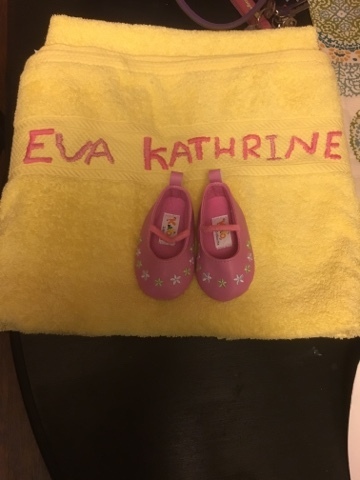 Sweet Isa, a director of the center, made Eva Kate the most wonderful hand-embroidered towel. The spelling wasn't quite the same, but it is perfect! What's Been Going On: Feelings-wise, I'm starting to experience back and pelvic pain more frequently. Baby girl is heavy!!! Life-wise, y'all. Nursery is painted; two pieces of furniture are painted; laundry room is reorganized. Nesting is serious!! 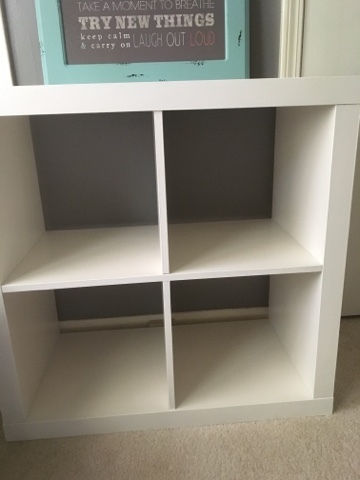 Just a sneak peak of the wall color and the four cube organizer. Full reveal will come in a few weeks! When I was growing up, I was taught "stay as far from sin as absolutely possible and as close to God as absolutely possible in order not to fall down the slope of sin." My parents never let me ask the question "what is wrong with that?" They always combatted me with "But Megan, what's right with it?" Lately, we are in the midst of such a culture that is a slippery slope. People in my generation love to dilly dally in sin. We focus on the grey areas of Scripture (which do those really exist?) and claim that we are totally fine as long as "Jesus is in our hearts." Or "we are covered by His grace and forgiveness." Y'all. Thats not how this works!!! “I’ve never had a problem drinking alcohol socially but in the past year or so I’ve allowed myself to slide into, in my opinion, the overuse of alcohol." This is where the entire problem in sin culture, grace-only culture Christianity. Sins come in a slow fade. I have no desire to argue drinking--whether it's right or wrong. I don't want to argue sexual conduct--where the line is. What I want to focus on is that we should stay as far from sin culture...as far from the edge of the slope as absolutely possible! Salvation comes by the love and grace of God. He welcomes us, junk and all, into His family and desires us to be part of His family. With that, comes becoming more like Christ! I could choose many Scriptures to back my point, but 1 Peter 1:16 sums it up in 6 words--"Be holy for I am holy!" Our goal isn't to be Saved and have as much worldly fun as possible. That shouldn't even be our heart's desire if we have truly been welcome into God's love and His family. Once we are enveloped into His family, His Spirit should be convicting us to change--to be Holy, like Christ and only Christ is holy! Our pastor said this week, "I've met too many people who want juuuuuust enough Jesus to get into heaven but want to live their lives on their own here." What a wrong mentality!!! John 3:30 says "He must increase; I must decrease." Christ paid the price for our sin so that we can have freedom spiritually. Out of gratitude, out of respect, out of love--let us choose Him. Let us choose to be more like Him. A couple of weeks ago, Mackenzie was going to enter a cake into our church's pound cake competition. She decided to go for cute-ness and use a "regular" pound cake recipe. Morgan was making a cake at their house and so she decided to come to my house and do it. I told her I would be taking my Sunday afternoon nap and not able to help her ;). Well....as I'm napping, I hear "oh no, Megan's gonna be so mad!" Of course I couldn't leave that alone, so I headed to the kitchen and this my friends is what I found. She was a little anxious and clearly there was an issue when using the kitchenaid mixer! She is used to a hand mixer and didn't worry too much about putting dry ingredients on top of wet ingredients and then turning the mixer on high. That is CLEARLY a no-no when it comes to the kitchenaid! The finished cake product was quite delicious. She needed one round cake and several cupcakes for her design. We tested a couple of the cupcakes. Yum-o! Mackenzie colored and whipped some icing in the kitchenaid and iced all of the sides of the cupcakes, as well as several marshmallows. June started off SUMMER and it started with a BANG! I've spent a lot of time hanging out with the interns getting things ready at church and doing work for our mission trips and kids programs. The "mid season" between Cross Country and Track is in full swing and these girls have trained hard and raced harder. I can't wait for the fall! We had to say "see ya later" to some of our dearest framily. It was definitely the hardest thing we've done in quite some time. Moose and I helped with Kidz Adventure Camps. We taught the rocket class (woot woot) and our kids did an excellent job! Every single rocket made it up! I went to Charleston on our mission trip. Moose started his new job with Polymed that same week! We rounded out June with a block party at the Williamston Park with our church and two others in the community as well as Mackenzie's first basketball tournament with school ball. It's going to be a good year for basketball (here's hoping!). June...summer...I do love this time of year so much! I prefer the fall, but love the busy-ness of summer activities, camp, family time, and so much more! Sleep: Trying to be a good girl and sleep on my side rather than my back and I'm having a hard time getting cozy. Best moment this week: I think she is spreading out a little bit and not sitting as scrunched and low. 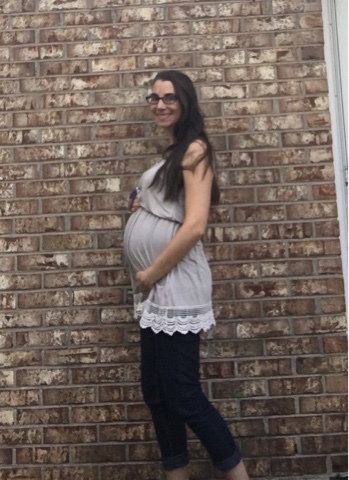 I felt some kicking higher up (closer to my belly button) this week! Movement: Yes! I'm totally cracking up because she is SUPER active. Still going crazy in there. Food cravings: no cravings during this part of pregnancy. Feeling some indigestion and heartburn after eating! Have you started to show yet: yes! Apparently after I got home from the mission trip, I was looking "especially larger" according to my husband! 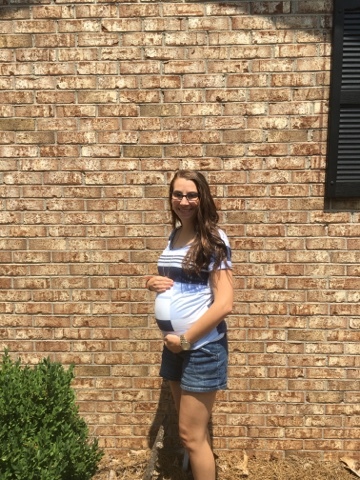 Milestones: For some reason 24 weeks feels like a huge milestone. I have no clue why, but I feel accomplished as she starts growing and is SO close to viability. Eva Kate is 1-1.5 lbs and about 11 inches. She has plenty of capillaries and veins and is growing! Major Happenings: We got home from Charleston and the procrastinator in me had a TON of school to do. I probably spent 50-60 hours working on things (so no blogging), but we prevailed! What's Been Going On: Feelings-wise, I have felt really good! However, my tummy is still feeling full of baby. My back has been annoying me lately (but I've been working on side sleeping and using my maternity pillow). Life-wise, this week is going to be a busy one (y'all, they all are in the summertime)! It is the week prior to the Dominican trip and all of the Roberts (minus Chelsea and myself) are going. There is a TON of prep that needs to be done! We also start a new kids Wednesday evening series this week, so decor has to go up. Looking Forward To: Working on the nursery and getting some things done at home. Getting people ready for the DR trip. This next month--phew--whirlwind of activity!